e-XAM ONLINE is the online version of the recruitment exam conducted by TNPSC. e-XAM ONLINE version of the exam is very similar to the regular exam, the only difference being the mode of answering. In the regular exam, you mark your answers on the OMR sheet with a pen. In eXAM ONLINE, all you have to do is to click on the correct answer on the screen using the mouse. TNPSC launch this e-XAM methAod for the posts Horticultural Officer, Assitant Engineer - auto mobiles, Post graduate teacher and School Assitant held on 9-12-1012. 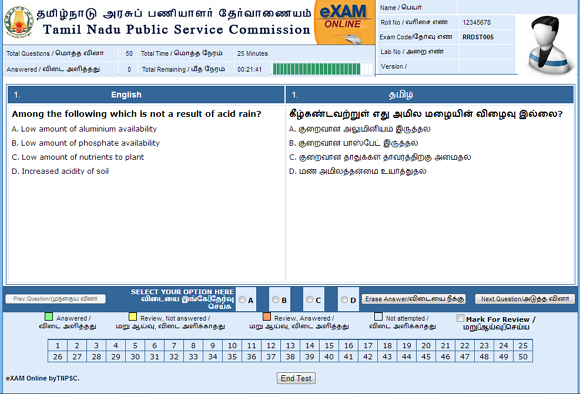 Now TNPSC relesed new sample test for candidate to experience about e-XAM Online. Now you can see Sample Test page with questions and answers, read questions carefully and select the right answer and then click the next button to go to next question. After you completed test click on End Test button, once you click on End test button you wont modify your answers. So think twice before hit the End test button.